“The Deepest Acceptance is a beautiful book. Thank you!” – C.B. “Just finished the book yesterday. So precious! Reading it again. Perhaps the best readings on relationship and addictions ever for me. Thank you Jeff! !” – M.H. “I bought it the other day! It was amazing! Thank you for your insights and sharing your journey!” – N.C.
“I finished reading The Deepest Acceptance about a week ago and I want to thank you for bringing the relative back into Advaita…” – M.B. “Thank you for your book. It has brought peace and clarity to me through trauma and pain and helped me see with eyes of love again.” – R.K.
“I have been doing the exercise around compulsion from your book…I have not eaten any kind of sugar for days and I do not even miss it. It’s the first time in years. Thank you.” – N.T. “The Chapter about Addiction in your great book “The Deepest Acceptance” helps me more than each book I have ever read about food problems and diets. I have problems with food for twenty- five years or longer and the overweight as a result of it, is a problem within the problem. This in combination with a compulsion with numbers I have so long as I can remember, one can say that I am not free at all, but live, although I have a beautiful profession, in a self-created prison. Your book shows me a way out. Thank you so much” – P.D. “I love the idea of acceptance as something to be recognised and not done. Almost every spiritual teacher says, you have to accept this and that, accept your non-acceptance, create the second layer of acceptance, etc, etc… and now I read your book and I am blown away by “everything that is, has been already accepted by what you really are. The ocean has allowed the waves to arise…” It is so refreshing, thanks.” – M.R. “Of the hundreds of books I have read on spirituality this is perhaps the clearest, most succinct. If you are looking for another book on “spiritual bypassing” move on. This is about embracing the totality of what it means to be spiritually human, embracing ALL the gifts of our precious lives with conscious presence and depth. I cannot recall ever reading a book that is more clear about relationships, addictions and the common endless pitfalls of spiritual seeking. This is a book that will help you understand why so many spiritual book junkies have been sucked into a vortex of endless searching. This book will bring you back to the most powerful teacher on the planet: your life. I hope Jeff comes to Sedona and helps the multitudes of disembodied “seekers” here understand and fully feel what it means to be alive, present and awake to the splendor of life in its totality!” – B.B. “(Your book) is really astonishing! I am familiar with similar teachings, but the way you hold it together, the raw, radical simplicity, just blows my mind, literally speaking! – M.G. “I’ve read Jeff’s book and it’s truly a masterpiece and an eye-opener!” – J.R.
“Thanks for a beautiful book Jeff! The ‘recognition’ of peace you speak of is exactly that – a RE-cognition of that which has never left us!” – P.B. “(The book) sure helped something to click for me… something moved that hadn’t yet moved….” – S.W. “Just wanted to write and say how much I am enjoying your new book. It’s written with such warmth and clarity” – M.J.
“The Deepest Acceptance is my favourite book of the year. I am rereading it and as I do I feel blessed, connected and totally loved. It is such an exciting read. I’m buying 2 copies for presents too. If you only buy yourself one gift this year make it ‘The Deepest Acceptance’.” – J.M. “Thank you. This book is going to save my life.” – A.S.
“Thank you for your book and making it so clear that all that appears already IS… and that there is nothing that I have to do, no more work, no more effort, no more shoulds and have to’s. Wow. The beauty is, that when I do work, scream, try to mould, manage, etc., that is also already arising and thus accepted. Never a NO and never anything “wrong”. Yes!” – A.B. “The Deepest Acceptance touches my heart so deeply and I am grateful beyond words.” – P.D. “Such a soothing balm for a troubled heart …the Deepest Gratitude.” – T.B. “[The Deepest Acceptance] is a gift, and the teachings are coming at the perfect time. I am especially impacted by the chapter on relationship and honesty…Your teachings are helping me … accept the part of me that is seeking… accepting all of it, the seeker and the one who knows that the seeking is preventing the experience of actually Being and Receiving Love. … I am opening more and more to simply “meeting” the human being in front of me…” – S.S.
“Great book… I so love it… soothing & calming with wonderful insights… thank you for sharing your wisdom.” – R.B. “Jeff I finished reading your books and watching your DVDs. Thank you so much man, it has changed my life experience in a real way. So long seeking, so exhausting!” – O.C. “Thank you so much for your excellent book! It is a masterpiece.” – J.R.
“So close, so simple, so special, reading the book, tears rinse the mud in my ‘I’s that made me think and feel for years as if i wasn’t good enough, and at the same time, always too much as well, ending right here, now…” – P.G. 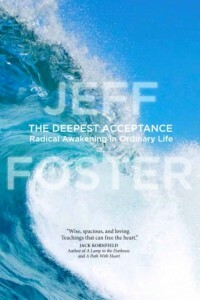 “Jeff Foster is easily one of the best known and effective spiritual teachers in practice today. Awakeness has been consciously functioning through him for a lot of years now, and it really shows in this new book. One word? Maturity. Another? Love. Jeff’s joy in all that is, precisely as it is, really shines here. He’s in love with life itself and he’s inviting us to the same dance. That’s always been Jeff’s message. The difference with this book, however, is that rather than just inviting us, he’s passing along his ticket! At last he’s telling us HOW. The absolute position that there’s “nothing to do and no one to do it” is a great teaching strategy to elicit a fundamental shift, but it is simply not the whole truth. Here is HOW to raise your understanding. Here is HOW to deepen your apparent personal surrender. Here is HOW to make more of a contribution to a planet that sorely needs your attention. In this book, Jeff lets the cat out of the bag with specific questions, suggestions, exercises and observations that we can use for ourselves to enhance our own spiritual maturity. This is great stuff; different from the general churn of material we sometimes see coming and going in the field. And this guy is absolutely For Real. As a result of my website I’ve had some dealings with Jeff, and I can report that he’s funny and generous, without a trace of elitism, or hint of arrogance. With this book he has come into his own, and we are all richer for it. Thanks, Jeff. “Reading this book is like reminding yourself of what you have always inwardly known but never quite managed to express, that at some deep level, beyond your mind – you have already said `yes’ to everything that is happening here, and although you may not like every detail of it there is a realisation that it couldn’t be otherwise and couldn’t be improved. As my mother used to say after she had told me off for misbehaving – `I will always love you, even though I don’t always like what you do’. This is a bit like the reminder that Jeff gives us in this book – that no matter what it looks like we are always an expression of this Love – because it is what we ARE – not something that we need to earn or achieve. Marcel Proust said: `The real voyage of discovery consists not in seeking new landscapes but in having new eyes.’ This is the amazing and yet ordinary message of nonduality – that THIS infinite moment is `it’ – and everything is unfolding here as it must – only without the `must’! This is not about `attracting abundance’ from the universe but about seeing that who you really are, beyond the play of individuality, lacks nothing and needs nothing – and therefore has nothing to fear. Once this is realised everything is transformed. Jeff’s style is fresh and contemporary although the content of his message is timeless. This is his first mainstream book and will appeal to both those new to his writing and to those long-time `seekers’ who may finally see that what they sought has always been right before their very eyes. Although very accessible this book is not simplistic or compromised – it is about a totally radical turnaround in what we see ourselves to be. “I really love your book. It’s clear, inspiring, and clear clear clear!!! … Every night I read a few pages so my sleep is drenched in wisdom without any goal ofcourse!” – J.K.